Well either way, I've set this up to work with an Arduino Uno - so far I'm just displaying the distance on a DF Robot 1602 LCD/w buttons. The laser can be turned on or off (assuming for aiming reasons), reads can be “automatic”, fast (less accuracy), and slow (more accuracy) - “automatic” appears to be about medium speed. “12.345m,0079” which tells the distance, and signal quality. Signal quality a lower number is better. 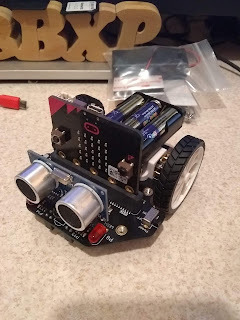 This is good for display, and easy to use for display, but it’s a problem if we need to compare the numbers, or if we are using this on a robot and need the robot to stop at a distance. Luckily - there is a way to remove the unwanted information from a string, and turn that string into a float - it’s not pretty, and a lot of code to do it, but it can be done. In my demo, I’ve converted the distance from meters to feet to cm to inches. I’ve dropped the signal quality - but it can be pulled out and used as well. The demo, will display if the laser is on, or off, the temperature and voltages (default temperature is Celsius, and I convert it to Fahrenheit), formatted for the display I am using. I’ve setup 5 buttons, one for normal reading, one for fast, one for slow - one will toggle the laser on or off, and one will display voltage, temperature. An expanded demo would be to use this on a robot for distance/obstacle avoidance. Merge two GIT repositories to ONE. Recently I wanted to merge two GIT repositories into one. The main reason for this was the two projects were different, but closely related, sharing much of the same code. And I just thought it would be easier if everything was together. I have developed a small experimental project A in its own Git repo. It has now matured, and I'd like A to be part of larger project B, which has its own big repository. I'd now like to add A as a subdirectory of B. How do I merge A into B, without losing history on any side?" This method worked pretty well for me, it's shorter and in my opinion a lot cleaner. This needs to be read - but the basics of it the arrows in the file show where the conflict is, and from which branch the conflict came from. And the equals is the dividing point. NewPing Library (Which I believe is this library) https://github.com/eliteio/Arduino_New_Ping and is only needed if you are going to use an ultrasonic. The Micro:Bit is setup to use Microsoft:MakeCode or Scratch and Python. The Sandee P Mistry Board core lets us use this board with the Arduino (C style) language as well. I used the general information that is found either in the Maqueen MakeCode library on the board itself, or from trial and error to come up with something that works (mostly) with the Arduino IDE. What’s not working: (These things work if you use MakeCode, but so far I’m unable to get them to work with Arduino). *RGB Breathing Ambient Light - unable to complete at this time. Line Tracking - Currently Working on it. Wireless Remote Control - * They are using a Micro:bit Gamepad (see below), I believe I can make this work with the Tablet and Adafruits Bluefruit LE Connect software * This is a work in progress. I am in the process of making a library and attempting to duplicate the applications in the DF Robot wiki. It is not even close to being ready. I’ll post a link when it is ready. This was very easy to port over to the Arduino IDE, the buttons are all HIGH until they are pushed then they go LOW. I may not be able to use this as intended because I am having problems getting two Micro:bit to communicate directly with each other. By piecing together a couple of instructables, and a “answer” from stackoverflow. And a couple of things of my own, I was able to get “Blink” to work on the LinkIt One board using Arduino IDE 1.8.5 - most of the thanks goes to user v-i-s-h from instructables Who provided most of what is needed. Both of these instructables where written by v-i-s-h. They mostly work as written - if you take the 1st one, STEP 1 and STEP 2 then start on the 2nd instructable, when that is done move back to the 1st for STEP 4 and 5. It mostly works. User Alan Wootton has the correct answer - you will still get compiler warning, but it works. v-i-s-h has provided a core url that will work on linux machines. You’ll want to find the LinkItOneLinuxArduino directory. ***DON’T REPLACE THE platform.txt file yet, there is a new version that uses the updated “packtag.py” tool. --So now we jump over to the 2nd Instructable. STEP 3 (STEP 1) Get the updated packtag.py package. And you’ll copy or move this file to the linkit_tools/1.1.17 directory from the previous step. And you’ll need to make the python script executable. You’ll need to right click on the link and then save as - if it doesn’t have the name platform.txt - rename it. Important - Restart the IDE! Now we can jump back to STEP 4 and STEP 5 from the original instructable. STEP 5 - Blink The Built in LED. Or can also replace all the LED_BUILTIN with the number 13. At this point, this is where the instructable kind of gets a little lost and confusing, So here is what I learned. You need to save the modified version of your sketch (To compile sketches for this board you need to have a saved copy somewhere that you can get to easy). What I found is compile the sketch, you need to have the board plugged in, it will fail to upload, but that is ok because we are not going to compile the sketch the way we would with a “normal” Arduino board. Now we need to switch the LinkIt One from UART mode to MS mode - what I’ve found about this is the battery for the LinkIt One needs to also be installed and on…. (this could just be me). Besure to make the mode change with the power removed. Once you restart the LinkIt One, a small 10Mb removable drive should show up. You are going to copy the “app.vxp” file to the MRE folder on the removable drive. In the root of the LInkIt One drive you’ll see an ‘autostart.txt’ file, and you’ll need to edit it and point it to the app.vxp file, not the test.vxp file it is pointed at. Disconnect your LinkIt One, (make sure battery is off as well, no power) - put it back in UART mode, and you should see the LED blink (or your sketch run on it).